Discussion in 'Roller Coaster Construction' started by pawel98123, Oct 27, 2018. The wind was blowing roofs, roof tiles and chimneys, turning trees on roads and cars. There are also damaged power lines, there can be up to a thousand people without electricity in our region. The current was missing even for a moment even at the hospital in Wadowice. Firefighters accepted hundreds of applications. On Monday at 1.40 in Inwałdzie the wind was blowing at a speed of 103.6 km / h. 3.15 in Oświęcim until 112 km / hour. I also doubt that it is Energyland's fault and that they built too fast ... The construction was not finished, no wonder it was less durable. The wind was blowing at over 100km / h .
JuliOverbank, Matt N, Pear and 4 others like this. Okay, well I guess "phew" in the sense that that would probably be considered exceptional circumstances. While not knowing about much about engineering, I can see your point but as Hixee is an engineer. He's not taking stabs in the dark. That being said.. if you remove the track from a ride, such as Colossos at Heide.. the structure shouldn't fall apart. It definitely shouldn't. But the coaster supports are not engineered to be standing without the track. Especially when extreme forces like a storm get thrown into the mix. It's just an unfortunate event at the wrong time. Agreed. Kind of. The final structure relies on the track being in place - absolutely - but in the temporary case the structure should be self supporting (otherwise how do you build it safely - in one day?!). Totally agree that this looks like an perfect storm situation (excuse the pun). Yeah holy crap. I don't think I've ever seen that happen before. Even with 40-50mph gusts.. you shouldn't see the whole structure fall over. I do feel like a "I told you so" coming when I mentioned the park is building too fast for it's own good. Imagine this happening while people were riding it.. This is the biggest reach for an 'i told you so' I've ever seen. This has literally nothing to do with the rate at which the parks expanding! Wind loads are awkward especially when its for a non typical structure dependent on phasing. Doesn't excuse anyone though, but as @Hixee said its likely a perfect storm multiple variable design condition scenario, definitely not Gods wrath for Energylandia getting too many creds. Yoris Kerkhoff, owentaylor121, CoasterMac305 and 3 others like this. I'm sorry, but that just IS true. If the top of the structure isn't self-supporting in a robust way, then you use temporary bracing to ensure it is. Sure, it won't be quite the same as the finished system, but for this to happen means that the structure was not safe*. It's exactly the design principles behind many large structures (my knowledge is mostly in buildings, but the same applies to bridges, towers, scaffolding, etc) - they have to work in the temporary case just as well as the final case. Supporting this. I would guess the same Eurocode standards apply in all those cases, so if you know those rules hold true for the UK, they should hold true for Poland too. I'll agree with you but mostly with regard to a steel coaster. We've all seen the crane dance when Valravn, Yukon Striker, and other tall, modern steel roller coasters were built - each piece of those rides works together to keep the ride standing. Wood is a bit different though - especially a ride with a structure as thick and dense as this though. Yes, the running rails will ultimately add a bit of strength - they're technically another support beam in the structure...but they're one of hundreds. The structure as we saw it a few days ago should have been so statically indeterminate that one beam failing shouldn't have had any effect on the rest. The structure as a whole looked quite well designed, but the weak point of any sort of assembly like this are the fastening interfaces which we just haven't seen a close photo of. But RMC should be familiar with high load mitigation in massive roller coasters...I won't suggest that it was constructed wrong, but...it was probably constructed wrong. You say that now but I've said it for a while. This may be reaching but if like this keeps happening.. crow shall be eaten. I still have massive concerns over many things with this park in general. You could argue staff management is still getting their sealegs and teething issues will happen but not to the tune of a death of an employee and a multi million dollar attraction straight up blowing over in the wind. I don't accept that is near the realm of ok, especially for a park of this side with this much ambition. I love me some RMC but they can make mistakes as well.. and if the park is pressing the company to build faster then they should.. 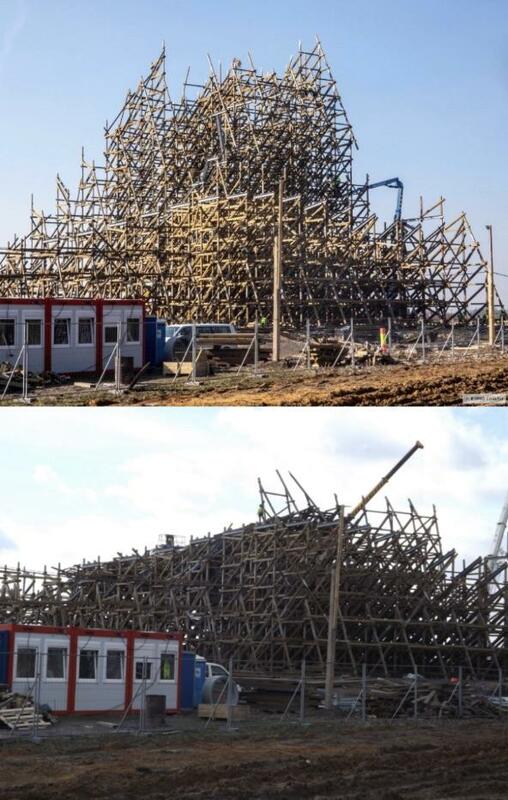 Remember when Outlaw Run was being built and everyone here was saying it was gonna fall over? Good before/after shot from someone on Reddit. They may have lost most of that structure, if the upper section has compromised the lower sections. Yoris Kerkhoff, Youngster Joey, Matt N and 7 others like this. I'd assume that the upper structure damaged a lot of what lies below. Even if it didn't you'd have to check and verify that. It might be quicker and more secure to tear it down and rebuild it. Unfortunately my guess would be that everything will take quite a while since the insurers want to take a look at everything. Could this mean that opening has been set back to its original 2020 target? The more I see these photos, the more I think of Son of Beast when it went down. Crazy how it dropped though. You would think if something had the CHANCE to collapse, youd avoid it right? good news: engineers from RMC are already doing expertises. Yoris Kerkhoff and CrashCoaster like this. Are you serious? We've just established that there was a storm blowing chimneys off houses and you're suggesting that maybe the park pressed RMC to build the coaster too fast and that's why it collapsed? You must know a lot about the inner workings of Energylandia, to be able to jump to your conclusions like that. Pretty impressive. Well, the coaster is on the ground, so something evidently went wrong. Also, it's really strange for such an airy structure to be felled by wind like that. There are no large surfaces to catch the wind, or loosely hanging stuff that can act as "sails" (like the leaves on a tree). Shouldn't the wind just pass straight through it? 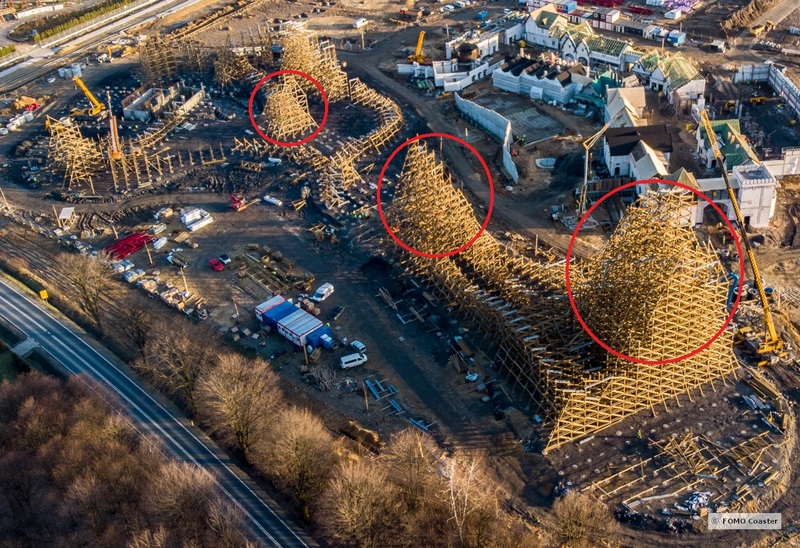 ...then again, that very assumption might have been made by the designers, and the result is the pile of lumber we're seeing here. Also, it's really strange for such an airy structure to be felled by wind like that. There are no large surfaces to catch the wind, or loosely hanging stuff that can act as "sails" (like the leaves on a three). Shouldn't the wind just pass straight through it?